For centuries, juniper berries have been used to boost the immune system to prevent various illnesses and ailments. In Medieval times, the berries were used to ward off the presence of witches, and in France, hospitals burned the plant to prevent the spread of infections and the bacteria that caused them. Today, the oil from fresh and dried juniper berries, as well as the oil in needles of the plant, is used due to the flavonoid and polyphenol antioxidants they contain. We will uncover the uses and health benefits of juniper berry essential oil. Juniper berry essential oil properties include antifungal, antimicrobial, and antibacterial agents, and can be used either internally or externally. Emit the healing components of juniper berry oil into the environment by diffusing it with a vaporizer or oil burner. This approach helps hangovers and targets emotional disturbances such as anxiety and addiction. Use juniper berry essential oil as a direct application for muscle fatigue, arthritis, joint inflammation, and gout. Massage the oil in a circular motion on affected regions. Add juniper berry essential oil to your bath water or favorite lotion or cream to treat skin conditions. This essential oil is used for acne, psoriasis, dermatitis, weeping eczema, and oily skin. Now that we know how to use the oil, let’s look at what exactly juniper oil is used for. What Is Juniper Oil Used For? Juniper berries can be used to reduce bloating as they are natural diuretics. In addition to promoting fluid elimination from the bladder and urethra, these berries can also detoxify organs. It effectively treats and prevents urinary tract infections, as well as bladder and kidney issues. Juniper berry oil can be combined with dandelion, fennel, and cranberries. The natural components of juniper berry oil can treat acne and other skin conditions such as stretch marks, skin infections, blemishes, and even foot fungus and odor. The oil can also treat skin conditions caused by changes in hormone levels. Juniper berry oil promotes the release of digestive enzymes to help with digestive issues like absorption and the breakdown of food into smaller particles. Use it as a dietary supplement to cleanse the liver by adding a few drops to a glass of water or your favorite smoothie. One of the most common uses of juniper berry oil is to treat anxiety and emotional issues. The aroma of the oil has a positive effect on brain signals for relaxation. Simply add a few drops to your laundry or dab it onto the wrists and behind the ear. Relieve symptoms of heartburn and acid reflux by taking a few drops orally, or apply it directly in circular massaging motions on the stomach and chest. Tight muscles and tense nerves can result in sleepless nights. Juniper berry oil can release tension and relax your body and mind. Simply massage the oil on the chest and neck at bedtime. We may enjoy the scent of the juniper berry, but insects and bugs do not. Use the oil as an insect repellent directly on clothes as a spray. You can also diffuse it with your favorite carrier oil to rub it on the skin, or place it in a vaporizer to repel bugs. Juniper berry oil may be a good cleanser for our internal body system, and it can also be used to clean your home. Purify the air with the oil in a vaporizer or diffuser, and use it in a water solution to disinfect surfaces as the antiseptic components can help target any existing bacterial strains in your home. You can also put the oil in the clothing or dishwasher to get rid of any lingering bacteria. For those who enjoy the taste of gin, you will be pleased to know juniper berry is the main ingredient. Add juniper berries and the oil to your favorite dishes, sauces, marinades, and drinks for a sweet and natural additive. You can soothe sore aching muscles with the natural properties of juniper berry oil. It may help pain and inflammation of injuries, joint pain, and arthritis. Simply mix the oil with a carrier oil and apply to the affected areas. 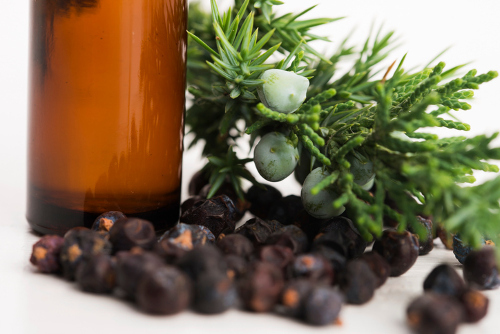 The natural components of juniper berry oil have powerful health benefits. It acts as a stimulant within the body to promote proper system functioning. Let’s learn about its properties to know when and how to use juniper berry oil. The traditional use of juniper berry oil has been to treat various injuries including open wounds to prevent sepsis and tetanus. This type of component stimulates blood circulation and eliminates toxins. So, juniper berry oil works against swelling, arthritis, rheumatism, renal calculi, and gout. Juniper berry oil can be used to ease cramps and spasms in the intestinal, muscular, and respiratory systems by targeting tense muscles. Juniper berry oil contracts blood vessels, reducing hemorrhaging risks. It helps with everything from hair loss and loose teeth to diarrhea and toothaches. As a unique agent, this allows loose muscles to tighten. Juniper berry oil has a carminative property that may help to eliminate gases within the intestines. It targets harmful gases that can result in indigestion, severe abdominal pain, chest pain, and an overall feeling of discomfort. It is also helpful in lowering the blood pressure raised by these types of gases. As mentioned, juniper berry acts as a detoxifier and cleanser, both internally and externally. With depurative components, the oil can target heavy metals, uric acid, natural toxic hormones, and pollutants within the blood stream. Patients with fluid retention issues may benefit with the natural diuretic component of juniper berry oil. It increases the rate and quantity of urination to remove toxins and excess water. These actions can also have a lowering effect on blood pressure. A rubefacient is used directly on the skin to boost blood circulation, even though it causes redness. By using juniper berry oil, you can promote better flow of oxygenated blood just below the skin surface. We depend on our body’s ability to release excess water, salt, and toxins through perspiration. The sudorific component of juniper berry oil stimulates excessive sweating to cleanse the pores by targeting sebum and sweat glands. As a result, it can help prevent various damaging skin conditions as well as acne. Juniper berry oil can help cleanse and nurture the stomach by stimulating the release of essential digestive gastric juices and acids, as well as promote bile flow. It is used to treat stomach ulcers and other disorders. The widely popular tonic drink is used to promote good health of the nervous, digestive, excretory, and circulatory systems. People who want youthful looking skin and toned muscles should use juniper berry oil as a tonic for these reasons. While juniper berry oil has all of these powerful components to help treat health conditions and ailments, it can also offer harm to some. It is not intended for those with kidney problems or pregnant women. You can combine juniper berry oil with other essentials oils such as cedar wood, cypress, bergamot, lavandin, lavender, lime, lemon, vetiver, geranium, and lemongrass. Make your own bath salts with juniper berry oil to unwind, destress, ease muscle pain, and stimulate the detoxification process. Mix the Epsom salts and baking soda together and store in the glass jar. At bath time, add the oils and the dry ingredients to a tub of hot water. Enjoy a 20- to 40-minute soak treatment. Raine, R., “17 Wonderful Uses for Juniper Berry Essential Oil,” Organic Daily Post; http://organicdailypost.com/17-wonderful-uses-for-juniper-berry-essential-oil/, last accessed July 18, 2017. “Juniper Berry Oil Will Make You Jump for Joy,” Mercola, February 16, 2017; http://articles.mercola.com/herbal-oils/juniper-berry-oil.aspx, last accessed July 18, 2017. “13 Incredible Benefits Of Juniper Essential Oil,” Organic Facts; https://www.organicfacts.net/health-benefits/essential-oils/health-benefits-of-juniper-essential-oil.html, last accessed July 18, 2017.